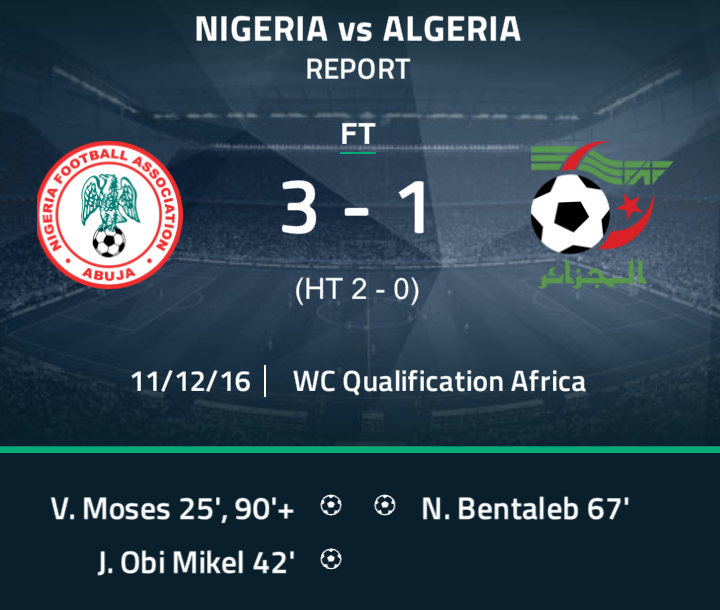 WCAQ 2018: Nigeria Trash Algeria 3-1, Set To Kill Cameroon Next. Nigeria remain top of Africa World Cup qualifying Group B thanks to a 3-1 victory over Algeria in Uyo this evening. A double from Victor Moses with efforts from John Obi Mikel were all the Super Eagles needed to tear apart the visitors at the Godswill Akpabio International Stadium. 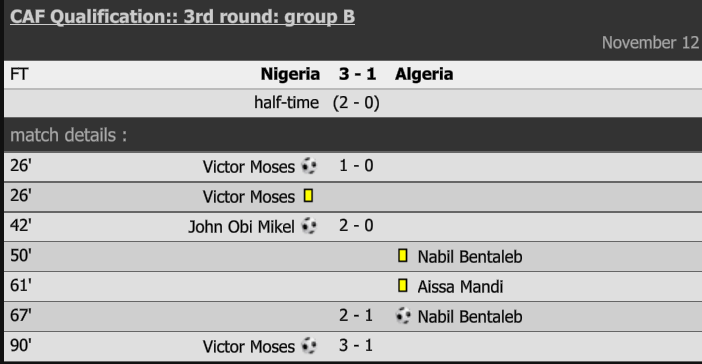 The result heaps the pressure on Algeria, whose winless run in the qualifying series extended to two matches. Mikel, who was included in the starting line-up turned in a great display to inspire his team to victory. 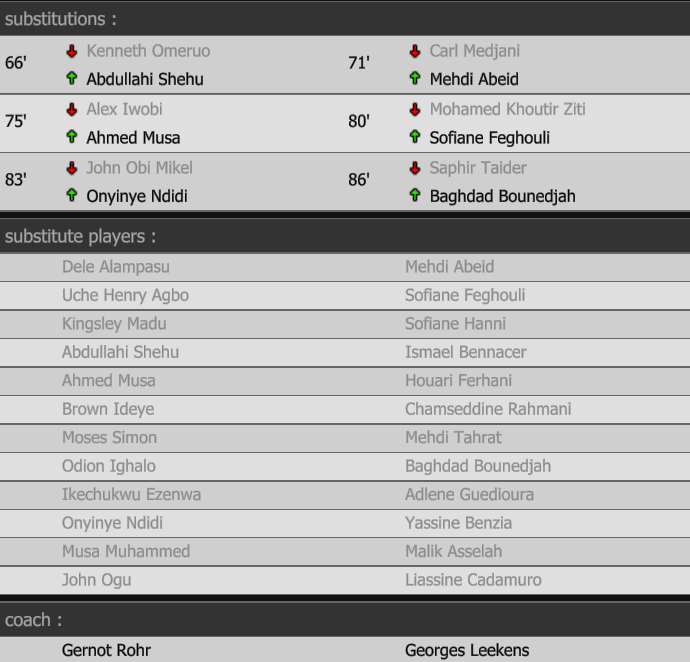 After a keenly contested opening minute, Moses took centre stage after 25th minutes with a ferocious strike past goalkeeper Raïs M'Bolhi after a one-to pass with a teammate. Yacine Brahimi missed an excellent chance to level before John Obi Mikel put the Super Eagles two goals up with three minutes to the half time break. 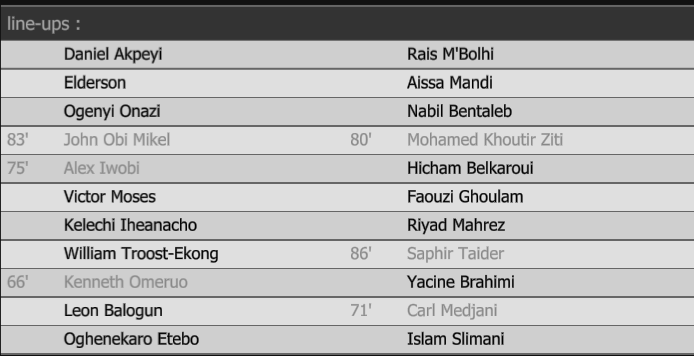 The Chelsea midfielder profited from a terrible defensive play by Aïssa Mandi, showing good composure with a calm finish. Algeria reduced the arrears early in the second half through Nabil Bentaleb – whose sizzler beat a hapless Daniel Akpeyi in goal for Gernot Rohr’s men. But Moses restored their two-goal lead in the closing stages of the game and, somewhat inevitably, it was Moses who got the goal, as he latched onto a slide-rule pass from substitute Ahmed Musa and fired past M'Bolhi with his left foot. With this victory, Nigeria lead Group B with six points – four points ahead of Cameroon who were held to a 1-1 draw by Zambia.